There are over 110 members of the panel representing different religions, different abilities and disabilities, and of different ethnic groups. The members are also spread geographically throughout Northern Ireland. I joined the NICCY Youth Panel in Spring 2016. I was always made to feel extremely welcome, by both the staff and the existing NICCY Youth Panel members. NICCY is a safe place for everyone to discuss their thoughts and views and still all get along at the end of it! Working with the Youth Panel I have developed skills that will help me in later life such as public speaking and critical thinking, as well as that, I've met so many new people from all across Northern Ireland who have given me insight into other points of views and ideas. For the past couple of weeks I have been working in the Safeguarding and Educational Inequalities groups. 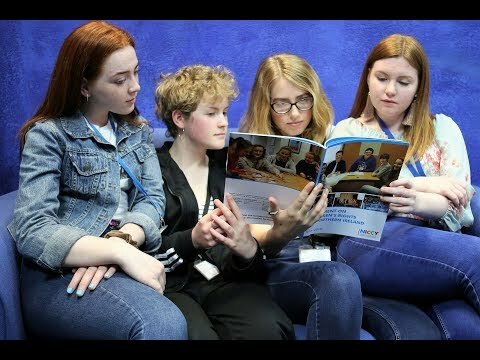 A group of us get together and discuss issues that affect the children of Northern Ireland and think about how to change them. Once we have a strategy in place, it is put into action. The staff make us feel as if our complaints and worries are valid and Koulla, the commissioner, is often present at our meetings. I am so glad I joined NICCY and I honestly see it as one of the best decisions I have made in my life. Everyone is so welcoming and friendly that I look forward to the meetings. If you get the opportunity to join NICCY I urge you to apply. I look forward to the future and continuing to stand up for the rights of the children of Northern Ireland. Hello my name is Kirstie Greer. I am 17 years old, on the Autistic Spectrum and have been Home-Schooled for almost 3 years. I have been with NICCY for almost 2 years and I have really enjoyed it. The Youth Panel is really good fun because you make new friends and you meet different people from other countries. They are understanding and the Youth Panel include me in all the different discussion groups. I have been involved with the Goods Facilities and Services (GFS) campaign. Currently under 18’s aren’t included in this law, but NICCY want to change this because young people are being discriminated against. I have also been involved in the Child Sexual Exploitation (CSE) campaign with Include Youth. I was part of a young person’s working group and we were giving our opinions on CSE to an independent inquiry. A report was issued last year and the recommendations are now being looked at by NICCY. So we hope that this will help everyone know what CSE means and hopefully schools will be more open to have talks or to discuss what CSE means to children or young people but will be age appropriate. During last year I met the Education Minister John O’Dowd with the Children’s Commissioner, Patricia Lewsley-Mooney, to discuss the educational difficulties I have experienced because of my disabilities. It was very exciting going to Stormont as a guest!! I heard about NICCY through my mother who received an e-mail from my school. The e-mail included an application form to apply for a position on the NICCY youth panel. At first I was reluctant as I had never heard of NICCY and did not know what to expect. However, my mother encouraged me to attend an induction day which explained the role of the youth panel and what it would involve. I am so grateful that I attended the meeting that day as I immediately felt welcome. The NICCY staff and other youth panel members were all very friendly and were genuinely interested in the safety and needs of young people in Northern Ireland. Since then, I have been involved in interviewing, organising events and have gained many valuable skills such as communication and team-working throughout these processes. I have also gained a strong awareness of the issues facing children and young people in Northern Ireland today and the actions being taken to solve these issues. I have been given the chance to actively participate in addressing these issues along with the rest of the youth panel and other organisations. I have made many new friends from all over Northern Ireland and been lucky enough to meet people who share similar interests with NICCY from countries such as Norway and Bahrain. Being on the NICCY youth panel has given me many opportunities and experiences that I can build upon and continue to carry with me.